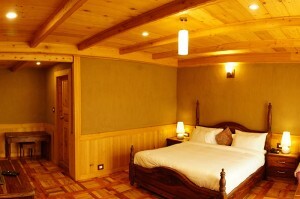 Use the form below to inquire about Handcrafted Resort in the Himalayan Valley . Use the form below to reserve for Handcrafted Resort in the Himalayan Valley . Air Conditioning (Hot & Cold), Free Wi-fi Internet Access, Hot and Cold Running Water, Mini bar, Private Balcony/Verandah, Safe, Tea/Coffee Maker, TV with cable connection in each rooms. These rooms have high wooden ceilings, private sit outs, and king size beds. Air Conditioning (Hot & Cold), Free Wi-fi Internet Access, Hot and Cold Running Water, Mini bar, Mini Kitchen, Private Balcony/Verandah, Safe, Tea/Coffee Maker, TV with cable connection in each rooms. 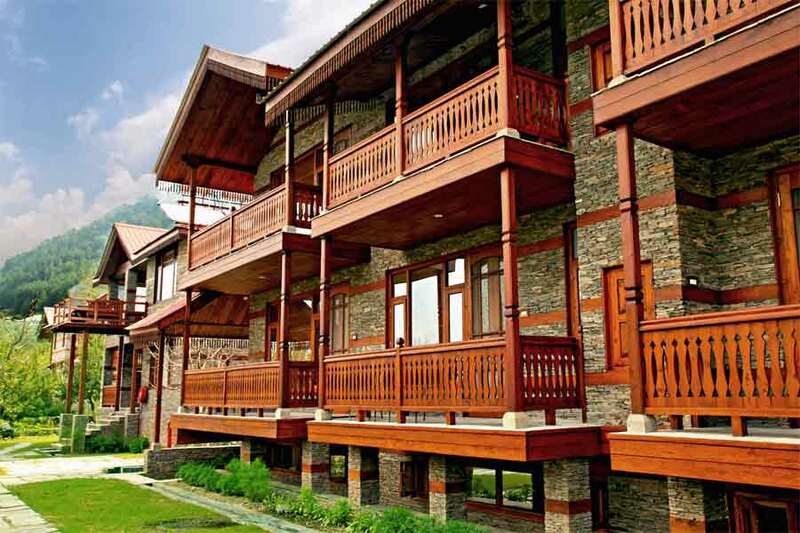 This Handcrafted Resort in the Himalayan Valley amidst apple orchards offers you unmatched views of the landscape. 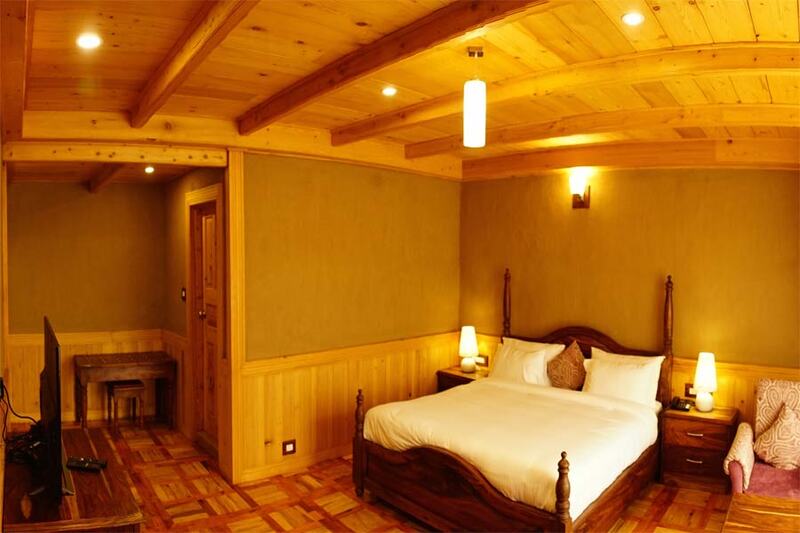 Situated near the village of Karjan a short distance from the city of Manali, this Handcrafted Resort in the Himalayan Valley has 15 rooms. Constructed in the Himalayan style with mud, wood, and stone, it blends with its surroundings effortlessly. Eco-friendly ideas and concepts are the themes around which this spectacular resort is based on. Almost 90% of the building has not been painted in keeping with the true Himalayan tradition. The rooms at this handcrafted resort in the Himalayan Valley are divided into three categories – Luxury, Elite, and Royal. Of these, 11 rooms belonging to the two latter categories, come with private balconies. Of the remaining four, two come with garden sit-outs while two feature sundecks. 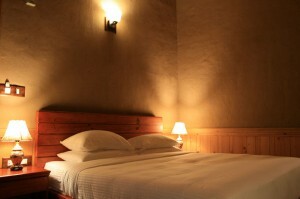 All rooms feature king or queen size double beds. 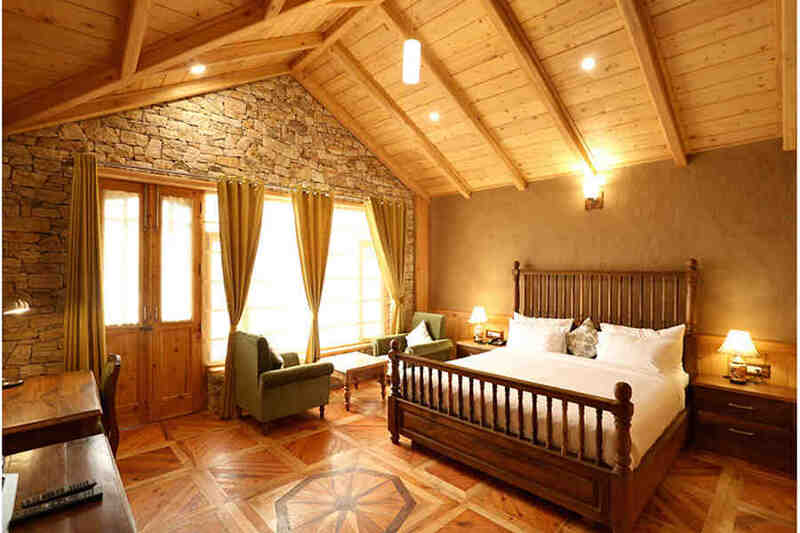 The names of the rooms relate to different places and regions of Himachal Pradesh. 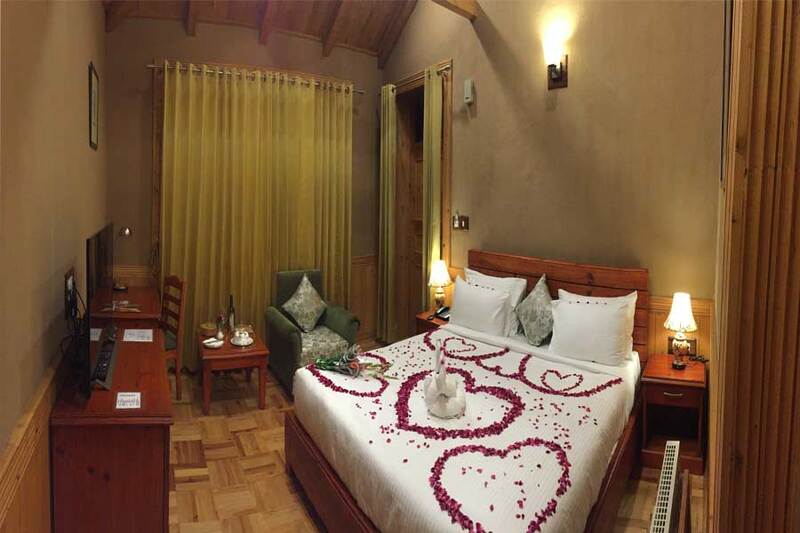 The luxury rooms are located in a cottage and have hardwood floors and a wooden ceiling while the furniture here is made of Fir wood. 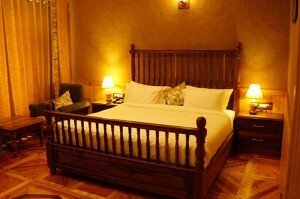 The Elite rooms feature furniture made of Sheesham wood while the furniture in the remaining rooms is of Fir and Walnut wood. 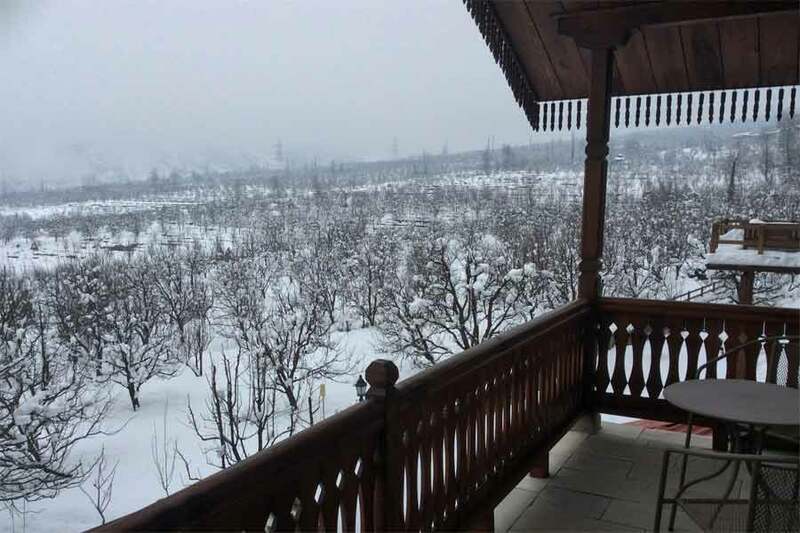 All the rooms offer views of the snow-capped mountains, the valley, the apple orchards, and the fields. In-room amenities range from LCD televisions to mini bars and electronic safes. All rooms have luxurious bathrooms with premium toiletries for your use. There are two restaurants at this handcrafted resort in the Himalayan Valley which serve up a variety of cuisines to tantalize every palate. Have your meals in the sunny garden or on the balcony. You can also enjoy a bonfire in the evenings while you feast on the barbecue dishes. Other facilities at this resort include a spa that offers steam, sauna, Jacuzzi, and massages, indoor games zone for children, and an activity and travel desk. Adventure activities and nature explorations can be arranged on request. As per the chosen plan. Extra charges for the additional person will be charged as per the chosen plan. A government-approved identity document is required at the time of check-in. PAN Card is not accepted as a valid identity card. The tariff will be on the MAP basis during peak season. The credit/debit card holder should be one the travelers if you have booked with us using any of these. We reserve the right to cancel or modify reservations where it appears that a customer has engaged in a fraudulent or inappropriate activity or under other circumstances where it appears that the reservation contains or is resulted from a mistake or error. Breakfast timings are 7:30 am to 10:30 am henceforth all requests will be chargeable. Child below 5 years – free on plan and sharing bed with parents. Child 5-12 years sharing a bed with parents will be charged as per the chosen plan. Extra beds will not be provided in Luxury Rooms. Only in Elite and Royal Rooms. Cancellations made 15 or more days before check-in date will be free. Cancellations made more than 7 days in advance but less than 15 days will incur a cancellation charge of one night’s tariff. In the case of a full refund on cancellation, there will be a deduction of approximately 5.7% as payment for processing charges. Amendments will be treated as a cancellation. Choose to go on the ‘Karjan Village Story Walk’. 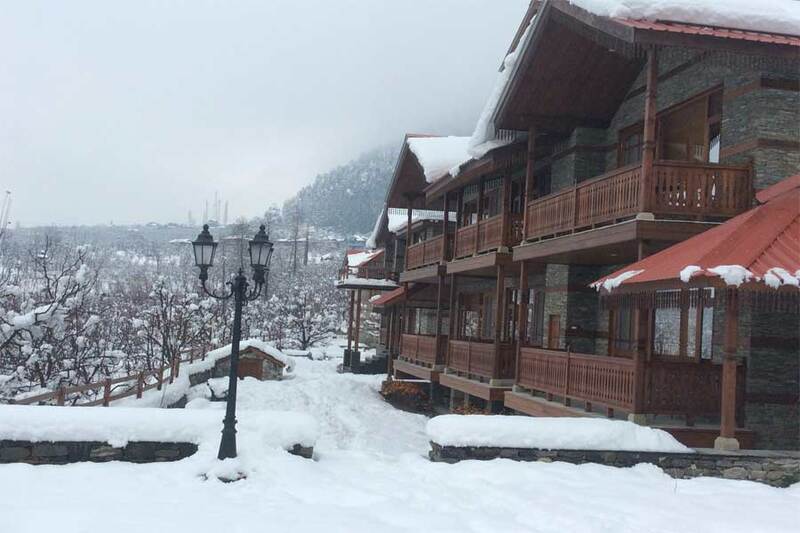 One of the largest villages of the Kullu Valley, Karjan is beautifully located on the base of a mountain with the forest on one side and the apple orchards and rice fields on the other side. This walk takes you through the village wherein you can meet the villagers, interact with them, see some wonderful old traditional Kath Kauni houses, a temple dedicated to the village Goddess Docha Mocha. As part of the Karjan waterfall walk, chance upon Himalayan birds such as magpies. Spend a while on the slope of the mountain looking down on the valley before you walk back to the resort. You can also opt to take a picnic lunch and enjoy it in an apple orchard, by a Himalayan stream, or in the midst of the forest. You can also learn to milk a cow, take tips on cooking authentic Himachali cuisine, and try your hand at mastering the art of Pattu tying. Pattu is a traditional dress of the local women made of wool in various hues. If you have your fill of trekking, hiking, and nature walks in and around the property, you can expand your horizons to include adventure activities and sightseeing. The resort can help arrange for activities like paragliding, rafting, mountain biking, fishing and camping, private bonfire, apple plucking, barbeques, yoga, meditation, village visit, local family visits and interactions. Kullu valley is also known as ‘The Valley Of Gods, and you might be able to witness traditional rituals and fairs that are unique to every village. Best period are from mid March to mid Oct when such rituals take place. Interesting places in the vicinity include Naggar village with its castle, Roerich Art Gallery, Tripura Sundari Temple, Krishna Temple, and Gauri Shankar temple. A little further on is Janna village with its attractive waterfall. 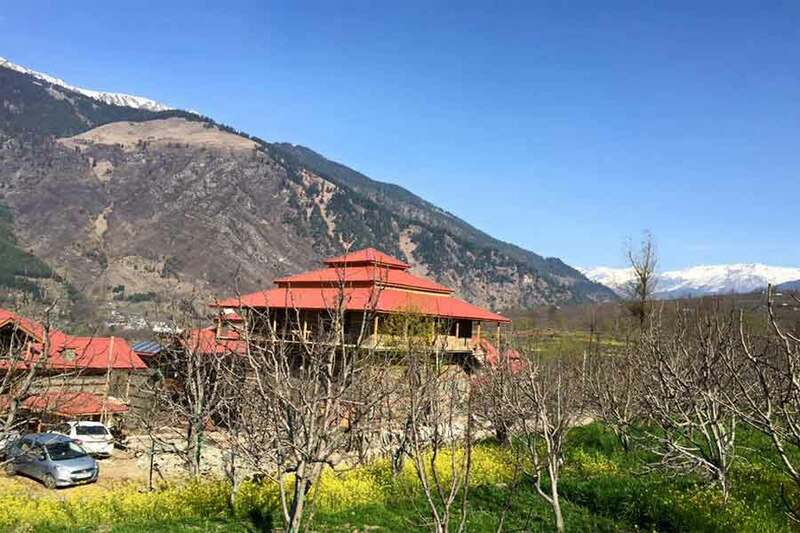 Sitting atop the mountain ridge, this village offers beautiful views of the Kullu valley as well as the Dhauladhar mountain range and one can trek upto Bijli Mahadev Temple. Besides the waterfall, Janna is known for its lip-smacking ‘rajma chawal’ or rice served with kidney beans. Of course Kullu and Manali are not to be missed when you are in the vicinity. 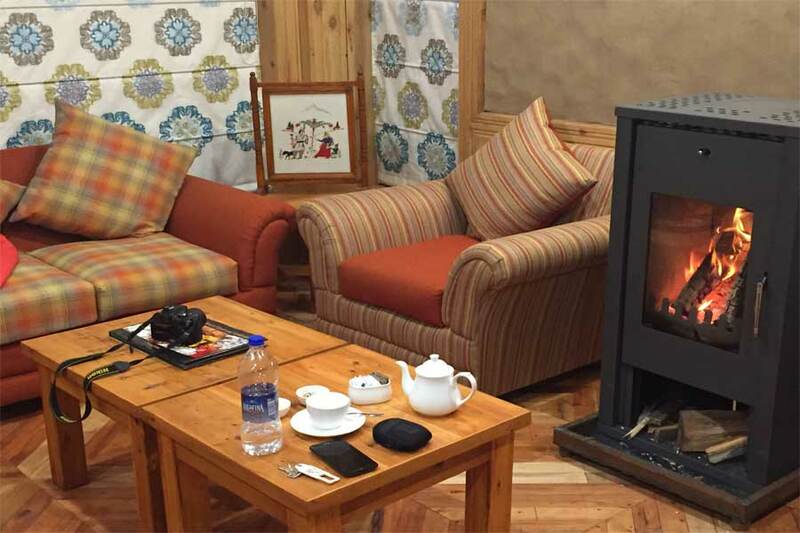 Sights to be visited in Manali include the Hadimba Devi temple, Vashisht Village and sulphur spring public baths, Tibetan monastery, and Old Manali village. The Raghunathji Temple in Kullu is believed to houses an idol brought from Ayodhya. Rohtang Pass is 63 km (appx 1.5 hr) from here. Situated at an altitude of 3980 m it is the gateway to mesmerizing Lahaul & Spiti Valleys. It’s also the first among numerous passes that you cross to reach Leh from Manali. Sollang is a small village enroute to Rohtang. This valley is famous for its numerous adventure activities and also for skiing in winters. Yet another destination is Manikaran located on the banks of River Parvati and known for its hot sulphur spring waters. There is an ancient Shiva temple and a Gurudwara. 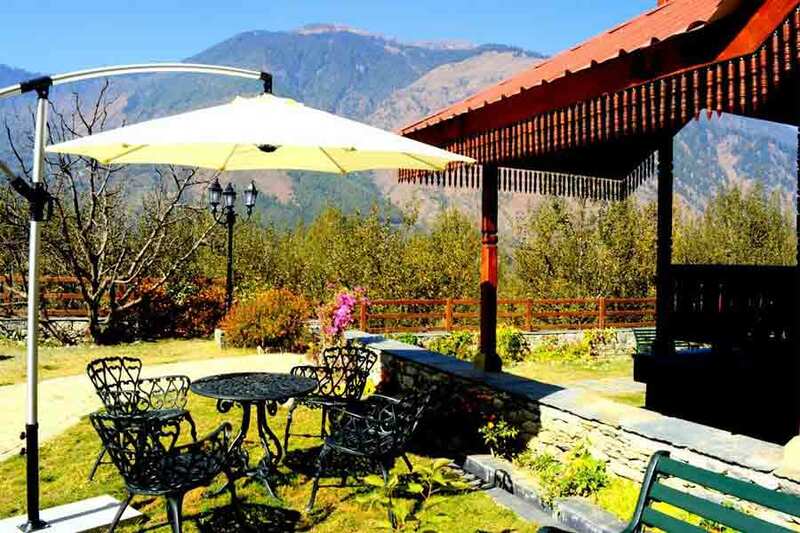 Nearby is Kasol, a small village popular with nature lovers and backpackers. 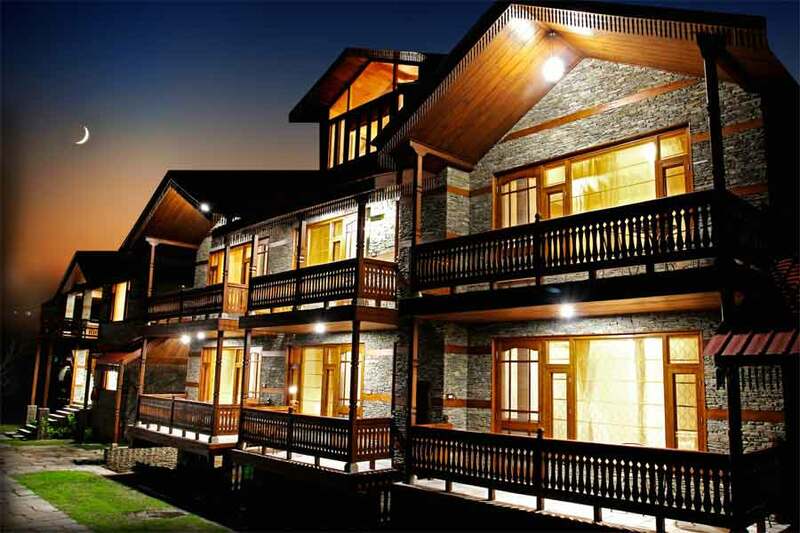 Kullu airport is the nearest at a distance of about 40 km (appx 1 hr) from this resort. 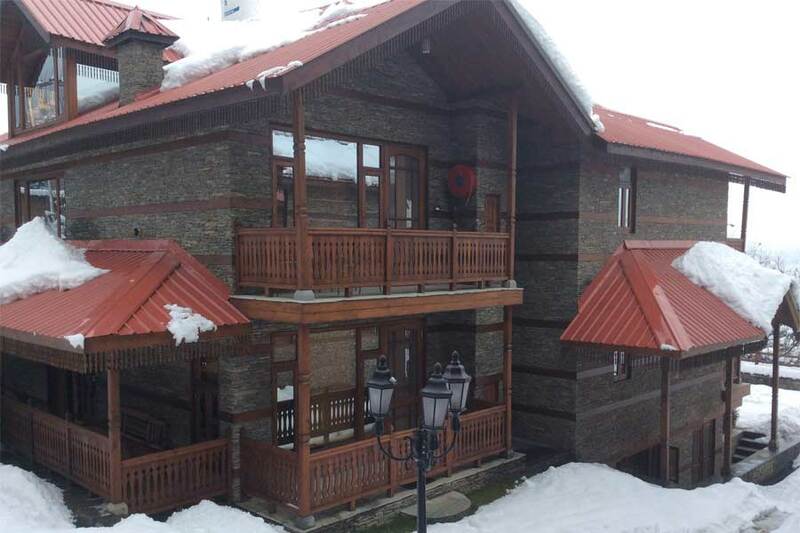 Manali is located just 12 km (appx 20 mins) away. From the airport, head south on NH3 and then take left onto Kullu-Naggar-Manali Road which is the SH29 till you reach Karjan village. Kullu town is around 30 km (approx 45 mins) away.